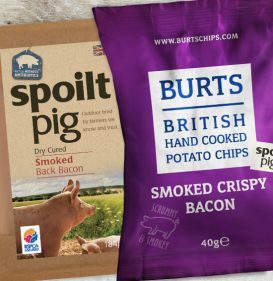 We’ve been working with those tasty chaps at Burts Chips to bring you delicious, gluten free spoiltpig smokey bacon crisps! Now you can enjoy Burts’ quality British chips with our mouthwatering, award winning, responsibly farmed bacon taste. The 40g bags are available NOW at shops nationwide. We’ll also have bags of them with us at the various events we’ll be at in the coming months so don’t miss out!